On deck, forward, full-beam Master Stateroom: Upon entry, there is a private office with desk facing large windows for a gorgeous view. The centerline king bed faces forward towards a 65 inch TV (hidden while not in use). Dresser to port. HER EN-SUITE is on the starboard side with Jacuzzi tub, Toto Neorest heated bidet/head with motion sensor, sink, and steam room shower with dual shower heads, hand shower wand, L-shaped seat. HIS EN-SUITE is on the port side with Toto Neorest heated bidet/head with motion sensor, sink and shares the steam room shower. Heated marble floors and skylights add to the elegance. Each his- and her- walk-in closet can be accessed from the stateroom or from the en-suite bathroom. There is a safe in each of the walk-in closets. 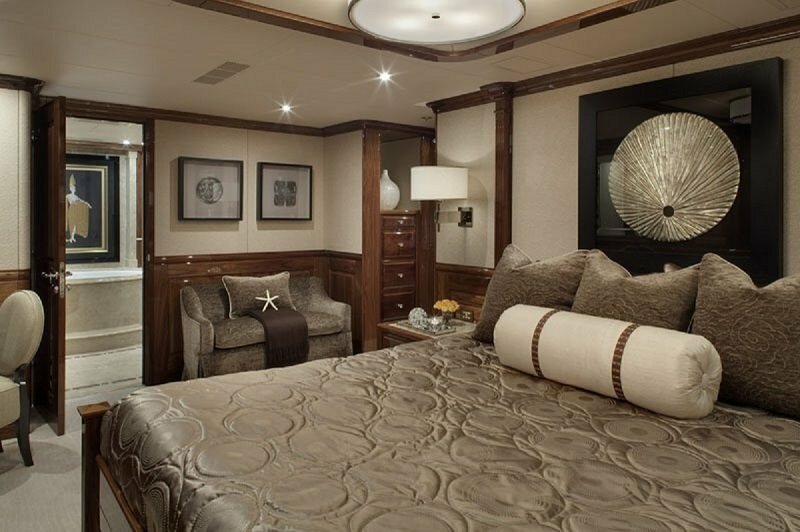 There are five guest staterooms midships on the lower deck which can be accessed by elevator. Forward: Two equal staterooms each with one twin-size bed, a Pullman berth overhead, and a double bed. Two port holes allow ample natural light. There is a 37 inch TV, dresser with drawers and closet. The en-suite bathrooms each have a shower with bench seat, sink, head and porthole. 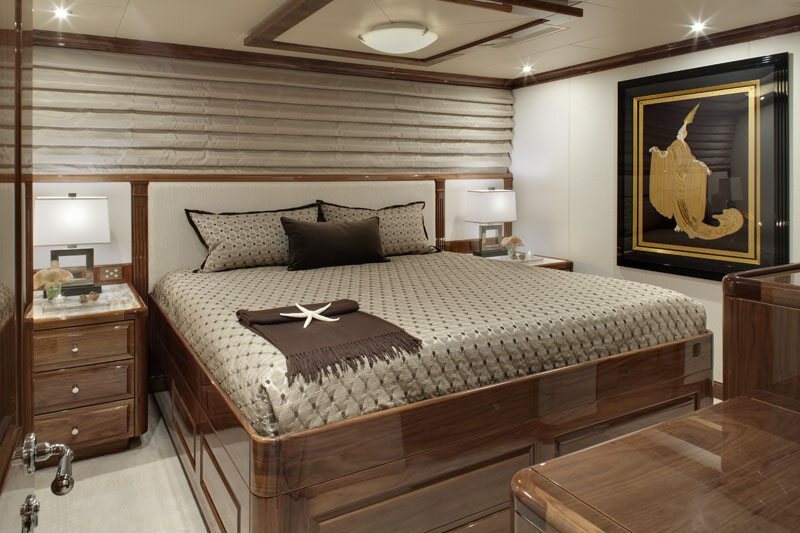 Mid: Two equal staterooms each with one king-size bed. Two portholes allow ample natural light. There is a 37 inch TV, dresser with drawers and closet. The en-suite bathrooms each have a shower with bench seat, sink, head and porthole. Aft: The VIP stateroom is a spacious stateroom with walk-around king-size bed, 60 inch TV, dresser with drawers and closet. The en-suite features a Toto Neorest heated bidet/head with motion sensor, his- and her- sinks, stall shower, and Jacuzzi tub. The main salon is semi-divided by a black walnut cabinet with back-to-back TVs (recessed when not in use). The lounge aft is an inviting space with Hamilton Piano. 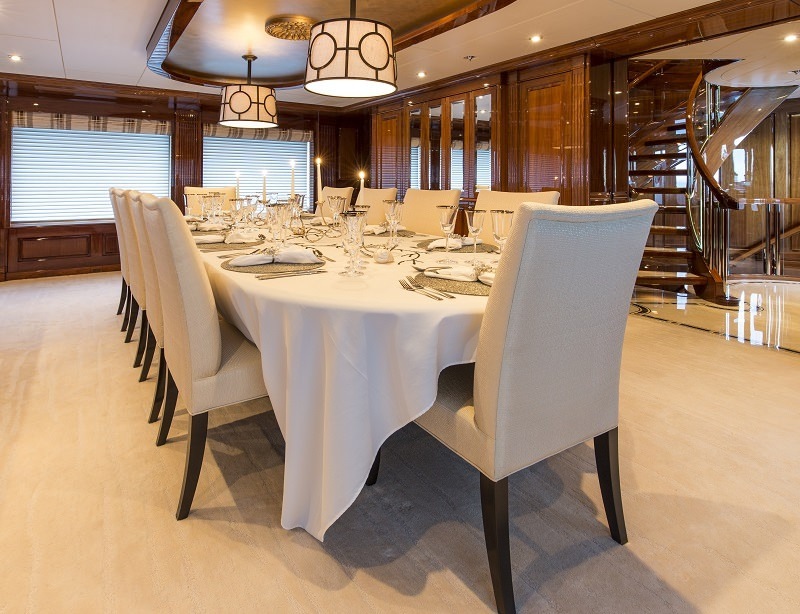 The formal dining area is forward and accommodates up to 12 guests. A pocket door leads to the galley and service areas on the port side. Access the elevator on the starboard side. The day head is also situated on the starboard side further forward. The aft deck is covered, and has a C-shaped bench seat with two tables and four additional chairs aft to accommodate 10-12 guests for a more casual dining experience. There is a full wet bar with three bar stools and 37 inch TV to port. 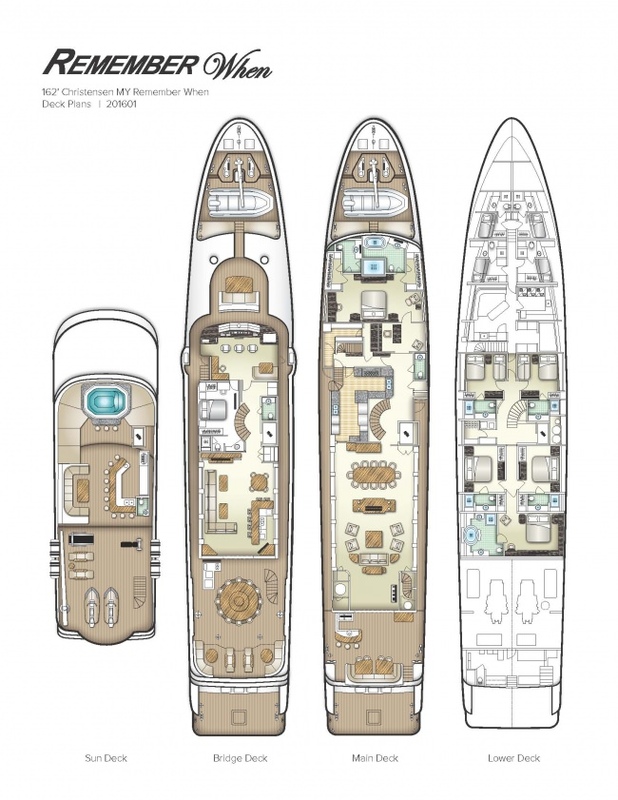 The aft deck can be air conditioned, and has wind doors to the walk-around decks. Access the swim platform on the starboard side or take the stairwell to the bridge deck. The spacious swim platform extends 10 ft, has safety rails, and underwater lights. Hydraulic (to starboard) with 20 foot extension. The SKYLOUNGE is a most welcoming and comfortable area with L-shaped sofa and two tables to port with a 3D 60 inch TV. 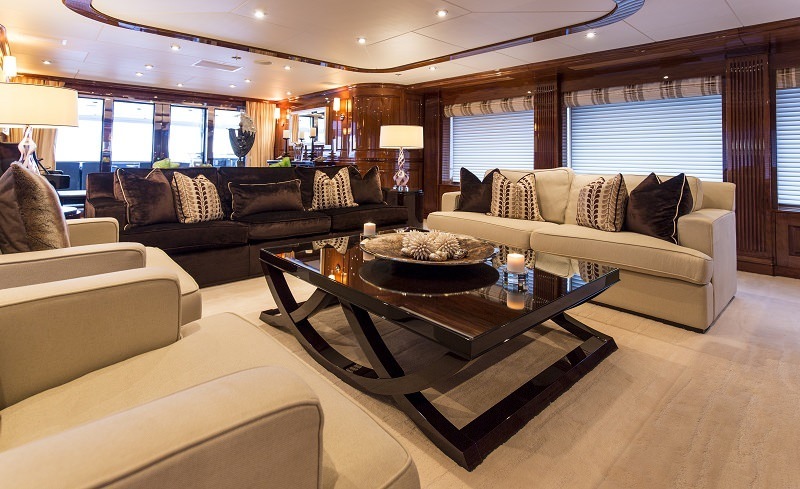 On the starboard side is a game table and recessed bar with an exquisite light up Onyx bar top, 6 bar stools, and a 37 inch TV. The day head is to starboard and the Bridge is forward with access to Portuguese deck. The black-out blinds make this space perfect for cinema night; or open up the aft doors completely to extend the skylounge into one space with the bridge deck aft. 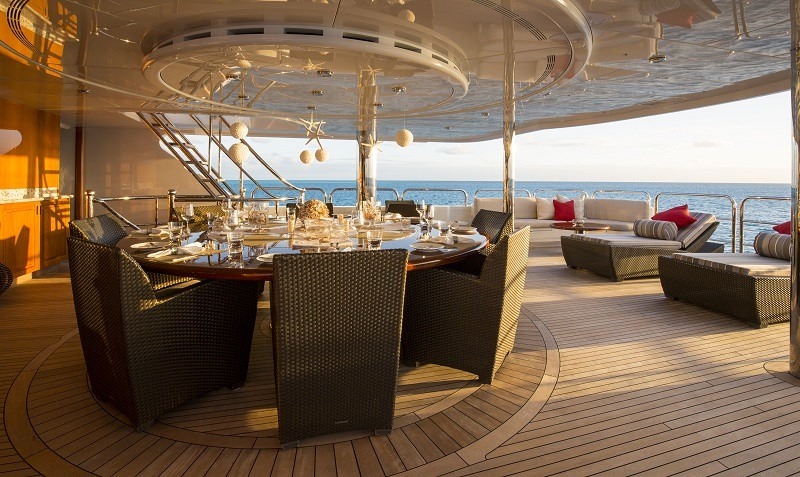 The al fresco bridge deck aft dining area is shaded with misters and A/C overhead, wind doors to port and starboard, plus the option of Eisenglass or privacy shades to port and starboard. Full wet bar to port and 60 inch TV to starboard. The large round dining table has a built-in auto Lazy Susan and can accommodate up to 12 guests. 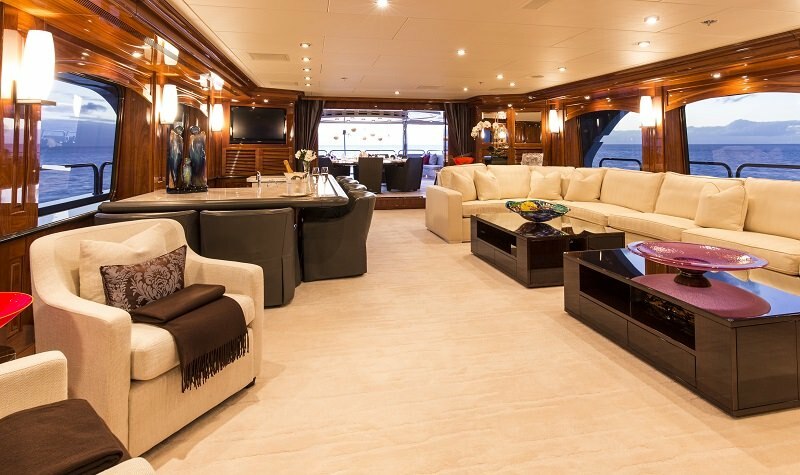 Aft of the dining area are two chaise lounges centered, plus an L-shaped bench seat with cocktail table to each side, port and starboard. 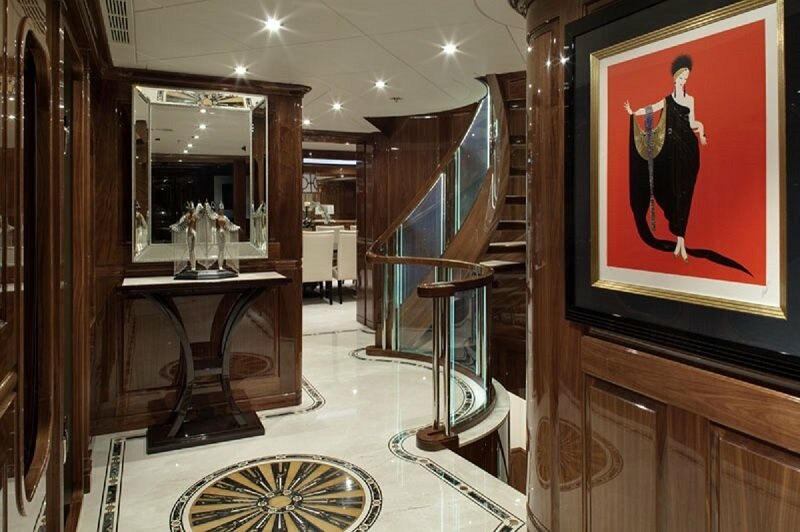 You can access the aft deck or sun deck stairwells on the starboard side, or walk around to the Portuguese deck forward. The bridge deck can be accessed by the elevator. (For wheelchair access, the elevator is 27.75 inches wide). 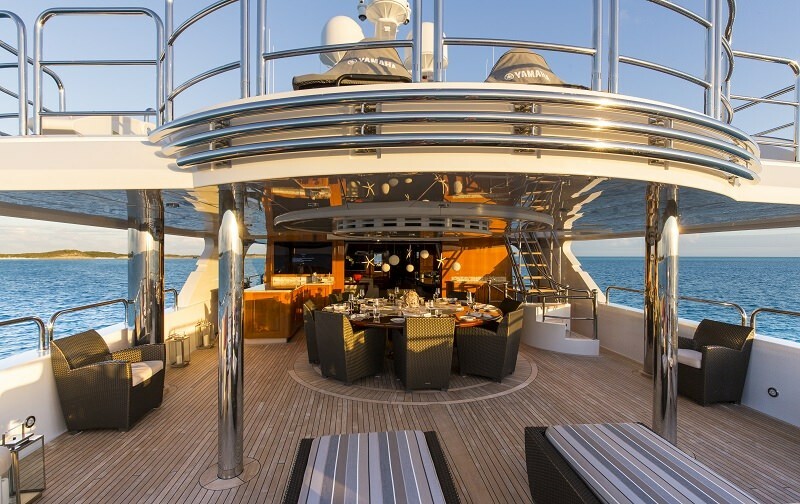 The sun deck is semi-shaded area with hard-top midships plus an additional three triangular sun shades forward if desired. The oversized Jacuzzi can accommodate up to 10 guests surrounded by large sunpads and is situated forward with three adjacent bar stools to enhance this space as a great social gathering place. 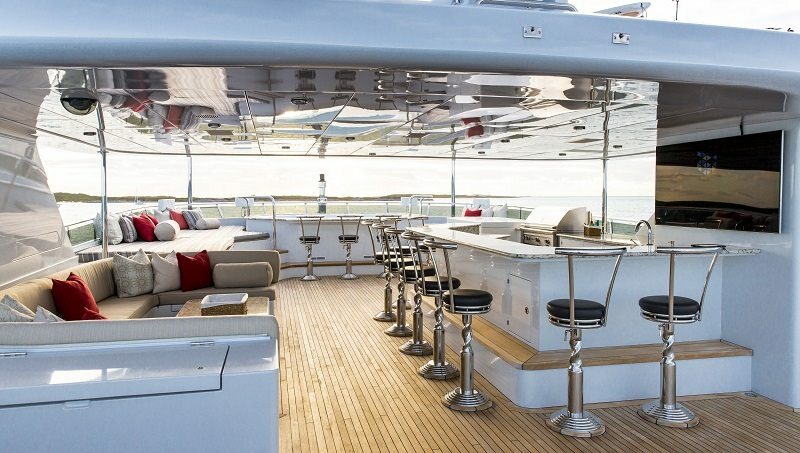 On the starboard side there is a full bar with nine bar stools, 60 inch TV, BBQ, and day head. To port is a comfortable C-shaped seating area with cocktail table. Aft is a terrific sunning area for those seeking full sun with 2 chaise lounges, toy storage while underway, and exercise equipment. The Sun Deck can be accessed by the elevator. Hendré (aka Hennie) was born and raised in Cape Town, South Africa, joining the yachting industry immediately after completing his education in 1999. As the son of a yacht builder and brother of a Chief Engineer, Hennie has a firm connection to the water and with a cousin also in the industry, you could say it's in his blood. He became a Captain at the age of 26 on board 157ft Christensen Nice n Easy. Hennie has been at the helm of Remember When since its launch in June 2010, overseeing the build and the maiden voyage from the Columbia River in the Pacific North West, down the West Coast, Central America, through the Panama Canal and San Blas Islands and back to our home port in Florida, and has successfully managed the vessel and crew since. He has traveled independently through the U.S., South America, Central America, Southern Africa, and Australia while pursuing his interests of returning to nature, camping, backpacking/traveling, motorcycle adventuring and cooking out. He enjoys all water sports especially paddle board surfing, scurf boarding and enjoys paragliding. Growing up on a farm and attending Agricultural school drove Hennie to build and run his very own hobby farm, overlooking Table Mountain outside of Cape Town in South Africa. Highly regarded by his peers and loved by his crew, Hennie is an integral part of the dynamics of the vessel and its smooth operation, as reflected by his impressive tenure. Francisco grew up in a peaceful seaside village in Kleinmond, South Africa. After finishing school his desire to travel led him to the South of France where his yachting career began. His experience as a captain has flourished since he started in the yachting industry 17 years ago. Francisco has extensive knowledge on some of the most pristine and exotic coastlines having cruised throughout Europe, The South Pacific, USA, Central America and the Caribbean. Francisco’s experience as a charter captain has not only allowed him to travel the globe but also meet various people from different cultural backgrounds. He takes great pride in his professional role so that guests can be assured of their safety, comfort and peace of mind while aboard Remember When. Francisco’s aim is to make sure your experience onboard is unforgettable, whether your desire is to visit ancient ruins or sunbathe on secluded beaches in the Caribbean. In his spare time Francisco enjoys being active, water sports and photography. Devyn was born in Pretoria, South Africa. At the age of three, his parents moved to Cape Town, known for its beautiful beaches and impressive backdrop of wineries. He got his start in the yachting industry in 2002 and now has 17 years of experience on various vessels between 50m – 74m, some of which have circumnavigated the globe. 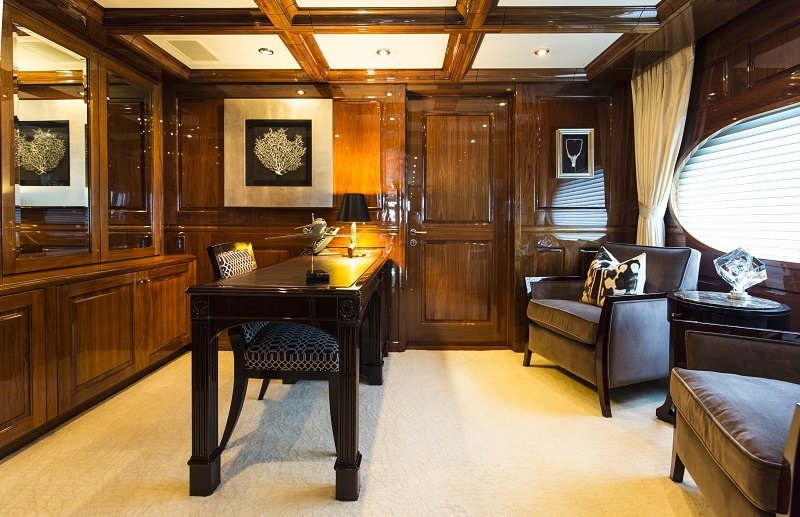 He has been First Officer for the past seven years on motor yachts Dragon-Fly and Majestic. Devyn has been fortunate enough to dive some of the most pristine sites around the world including the Maldives, the Red Sea, the Caribbean, Europe and the San Blas Islands. Devyn enjoys art, sky diving, diving, rugby, music and keeping fit. Kyle was born in Pretoria, South Africa. At the age of eight his family moved to Paarl in the Western Cape, where he was brought up amidst the mountainous terrain and lush wineries. 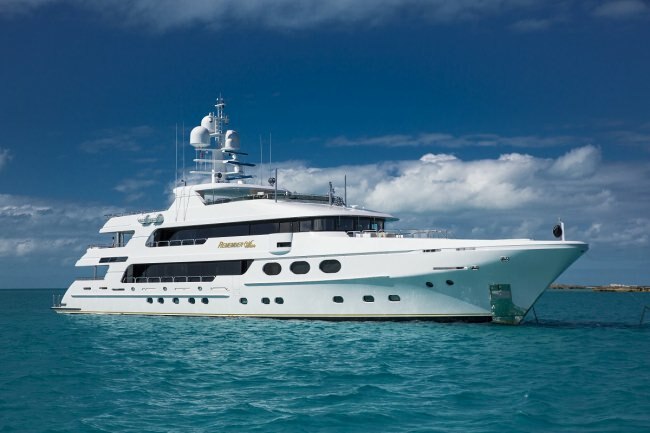 He joined the yachting industry in 2012 and has spent most of his time cruising the Mediterranean, Caribbean and the East Coast of the United States. Kyle has always been an adventure seeker. He is very active and he enjoys wakeboarding, sports, reading and the outdoors. Our Chief Engineer, Shaun comes to us from Blouberg, Capetown in South Africa. He began his career with boats at the young age of 15 working at the dockyards in Capetown during his school holidays and weekends. With 26 years in the marine industry under his belt, Shaun is a veteran of the sea. During this time, Shaun has worked both ashore and at sea, with 13 years in commercial shipping and 13 years in the yachting industry. During Shaun’s downtime, he likes to rebuild motorcycles, bobbers and café racers including rustic woodwork. Shaun loves to keep himself busy in the outdoors with gardening, bodyboarding, kiteboarding and playing with his Boston Terrier pup named Ozzy. Chef Tasia Haag trained in Dunedin, New Zealand qualifying with her certificate in London City and Guilds. She travelled to London for two years where she worked with celebrity chefs. Tasia then moved to Melbourne, Australia also working for celebrity chefs and later becoming head chef of 2 busy restaurants. During this time, she acquired a 6-month contract at ‘Montpelier Plantation Inn’ in Nevis, West Indies, which catered to the likes of Lady Diana and her family. Her yachting career started in Hong Kong in 1999 where she boarded her first super yacht. Since then she would spend time traveling extensively through the Mediterranean, Caribbean, Bahamas, Cayman Islands and the USA. This set her on a remarkable world-wide journey cruising for over 4 years to remote destinations including, Egypt, Golf of Aden, Seychelles, Asia, Indonesia, Malaysia, Papua New Guinea, and Australia. The importance of keeping her mind stimulated by training and learning different styles of cuisines is paramount to looking after both guests and crew which is why she trained in Thai cuisine, Cajun creole, (New Orleans), authentic Indian Cuisine from the Seychelles, West Indian and Sri Lanka. Her interests are diving, music/guitar, cycling, and reading. She loves learning, good food and good friends. Emma is a British national and is culinary trained. She has worked in some of London's top restaurants notably Gordon Ramsey's Aubergine, and as sous chef at Moving Venue—one of London's largest private catering firms working alongside a Roux trained Michelin star chef and catering events for up to 500. She has been a yacht chef for over 14 years and has even started her own chocolate line “Bitter Chocolates”. An interesting fact about Emma: she paints and has had two gallery shows. Bianca was born in South Africa but was raised in Mozambique from an early age. She spent her younger schooling years at a Portuguese school in Mozambique where her parents owned and operated a resort and Bianca's mother ran a diving operation. This has given Bianca exposure to many adventures in and around the water from an early age, completing her dive tickets with her mother as an instructor. Her high school years were spent at a boarding school in South Africa. Bianca speaks English, Portuguese and Afrikaans. Bianca has always loved traveling but decided after school to pursue her creative talent and undertake further studies in Interior Decorating. It was here where her ﬂare and love for interior colors, fabrics and ﬁnishes became apparent and she was introduced to some of the world's most lavish textiles. A call to the world of yachting followed and Bianca thoroughly enjoys bringing new and creative themes to the table, setting for ﬁne-dining experiences and producing all-round 5-star service for guests a board Remember When. Courtney is our in-house ray of sunshine from Auckland, New Zealand. With a contagious smile and positive demeanor, Courtney is drawn to people, so hospitality was a natural career choice for her. Courtney obtained a Bachelor of Commerce, majoring in Tourism at Otago University. She gained first-hand experience working in restaurants and private functions throughout her high school and university years. The position of Senior Event Coordinator followed naturally at the Stamford Plaza Hotel in Auckland, New Zealand. With a passion for the outdoors and travel, Courtney knew that the nomadic yachting lifestyle and its high standard of hospitality would be a perfect fit. She has been in the industry for six years and has traveled extensively through the Northeast Coast of USA, Caribbean and Mediterranean. Justin was born and raised on the East Coast of South Africa. His passion for the outdoors and giving back to the ocean and the environment led him to seven years as a co-partner of an NGO Fishing & Charity Outreach program. After studying personal training and sports massage, Justin joined the yachting industry in 2013 to pursue a career as a fishing guide. Justin recently worked closely with the RYA as an instructor, training new crew members in multiple sections. In his spare time Justin loves mountain biking, playing golf and surfski paddling. Born in Johannesburg, South Africa, Johan excelled in sports during his school years and subsequently went on to play professional basketball and rugby. He holds a Personal Training degree and has trained various sports teams and athletes, including a World Champion. Johan has always been passionate about aquatic life and the ocean. In 2006 he became a PADI Scuba Diving Instructor and spent the next few years living and working on various private islands throughout the Bahamas and the Caribbean. While embracing the tropics, Johan sharpened his skills in fishing, spearfishing and a plethora of watersports. During his spare time, Johan regularly goes hunting, fishing, surfing and golfing. Johan looks forward to making your time on board Remember When special by facilitating the watersports and adventures you have dreamed of enjoying. De Wet was born in Pretoria, known as one of South Africa’s three capitals. After high school, he furthered his education at the University of Stellenbosch in the Western Cape where he completed his bachelor’s degree in Industrial Engineering. Subsequently, De Wet decided to pursue the Engineering path and sought a job as second Engineer on a motor yacht. Since joining the industry two years ago, De Wet has been fortunate enough to travel most of Europe, Indonesia and the tropical islands of the Caribbean. In his spare time De Wet enjoys skiing, diving, fishing, being active and the outdoors. her studies she moved to France. She lived in the Alps for a few years and enjoyed meeting people from all around the world. While in France, Rachel discovered the yachting industry and soon started as a stewardess. Rachel wanted to provide more than just good service onboard luxury yachts, which led her to find her calling as a massage therapist. Rachel specializes in Swedish and deep tissue massage. In her spare time Rachel enjoys wakeboarding, snowboarding and skiing. Christina grew up in Mossel Bay, a beautiful coastal town in South Africa. She spent her high school and university years in Stellenbosch, which is the largest wine making region in Southern Africa. Christina studied pre-med and then went to work on a wine farm known for its high-end hospitality and picturesque beauty. After spending a season on the wine farm Christina pursued her desire to join the yachting industry. Since joining in 2016 Christina has traveled extensively throughout Europe experiencing different cultures while working at sea. Christina loves being active and plays basketball, water polo, swimming and she enjoys a variety of outdoor activities. Tina was born and raised in Somerset West, South Africa. She attended the University of Stellenbosch, where she studied Business Management Science and an Honors in Logistics, subsequently pursuing a career in the fruit export business. However, her passion for travel led her to the yachting industry where she has enjoyed working for the past three years. Tina is passionate about her job, loves to meet new people and is grateful for the adventures yachting naturally brings. She has visited numerus of places around the world, her favorite spots being Livigno, Iceland, Munich and Indonesia. In her spare time, she enjoys watersports, diving, leather crafting, hiking and trying local cuisine. Chenae was born in Pretoria but grew up in Cape Town, South Africa. From an early age Chenae was drawn to the hospitality industry, throwing dinner parties for friends and family as a young girl. After school she completed an Advanced Food and Wine Degree in Paarl which propelled her to start working in top restaurants in Cape Town. Chenae then moved on to working at a prestige catering company for a couple of years before discovering her passion for travel. Combining her love for adventure and experience in hospitality, Chenae came across the yachting industry which led her to traveling the Mediterranean extensively. Other destinations under Chenae’s belt include Malaysia, Maldives, Singapore, USA and some of the Caribbean Islands. She enjoys all outdoor activities, sports and has good knowledge of sailing.